Celebrating Easter should be important and it should be fun, but that does not mean that it has to be stressful or expensive in addition. Whether your Easter celebrations are centered on the reason for the season or even if you’re all just focused on holiday fun, “Do It Yourself” projects are always a good way to share the love. 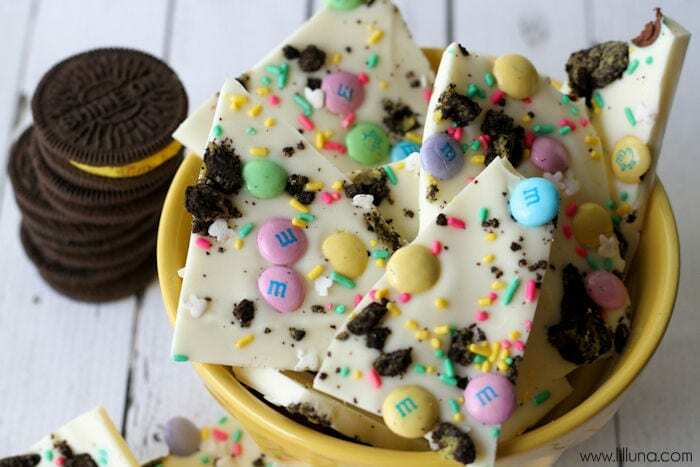 So if you’re looking for sweet treats to make with your kids, or if you’re looking for a quick treat to craft and then slip into an Easter basket, then this is the list for you! 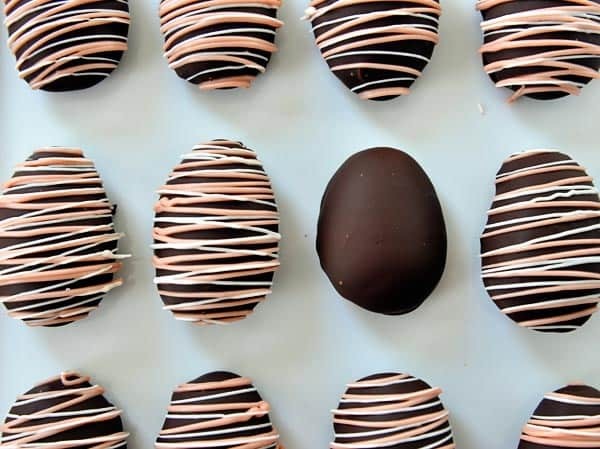 Check out our top ten favorite DIY Easter treat ideas for kids! It’s easy, it’s fun, and it’s festive! Besides, who doesn’t love Oreos? Or who doesn’t love a recipe that only call for four ingredients? You’ll need one package of vanilla candy coating, some pastel Easter M&Ms, a few Spring Oreos, and, if your heart desires, sprinkles! For all the tasty details, check out the recipe from Lil’ Luna. A forever favorite, the rice crispy treat is conveniently as malleable as it is delicious. Meaning that the marshmallow concoction lends itself nicely to be molded into the shape of an egg, which makes eating it all a little bit more fun too! You can customize your rice crispy rounds with frosting or sprinkles or just by using any kind of cereal. Our favorite recipe is from Mom Luck, have a look! Handmade Charlotte has inspired us with the most magical Easter treat. Imagine: a delicious white chocolate covered strawberry, disguised as a carrot. As simple and fresh as always, and a nice break from most of the processed sugar treats, you can find the recipe here at Food. So sweet in every way, these cookies will absolutely be a hit. Straightforward but not bland, they’re a perfect balance between effort and ease. With only a few steps and a few ingredients, you’ll surely have enough time to stuff baskets, hide a few eggs, and maybe even set out a few carrots for the big bunny himself. Go to Everyday Dishes for the full recipe! Now, if you’re really into sugar, and we mean really into sugar, this is the treat for you. 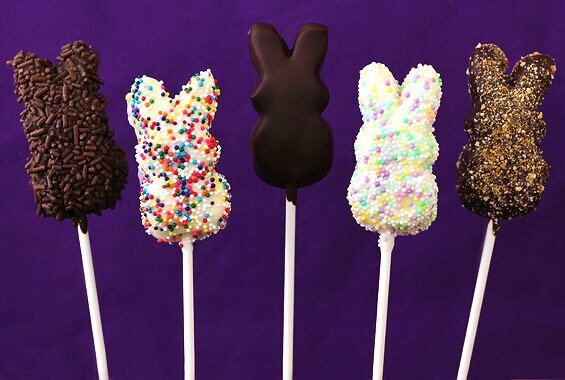 A little Peep, covered in chocolate, covered in sprinkles, on a stick. Honestly, what more could you want? Find out more at Gimme Some Oven. Another treat from Handmade Charlotte, this snack is perhaps as opposite from a Peep Pop as you can get. La Receta de la Felicidad has this recipe for baby carrots planted in hummus with roasted garlic and parsley. Enjoy! It’s healthy and completely festive. While perhaps not as easy or quick as some of the other DIY projects, we think that this craft is particularly worth the energy. It’s cute, it’s unique, and it’s interactive. All you’ll need is a candy of choice: jelly beans, chocolate eggs, gummy rabbits, anything! From there you simply cut out your rabbit shapes, sew them, stuff them, and then seal them for someone special to open on Easter morning. While this special treat is definitely a labor of love, it might also be well worth the effort. With homemade marshmallows that you’ll hand dip and decorate, this project really would be something to be proud of. If you’re up for the challenge, Mel’s Kitchen has the full story! 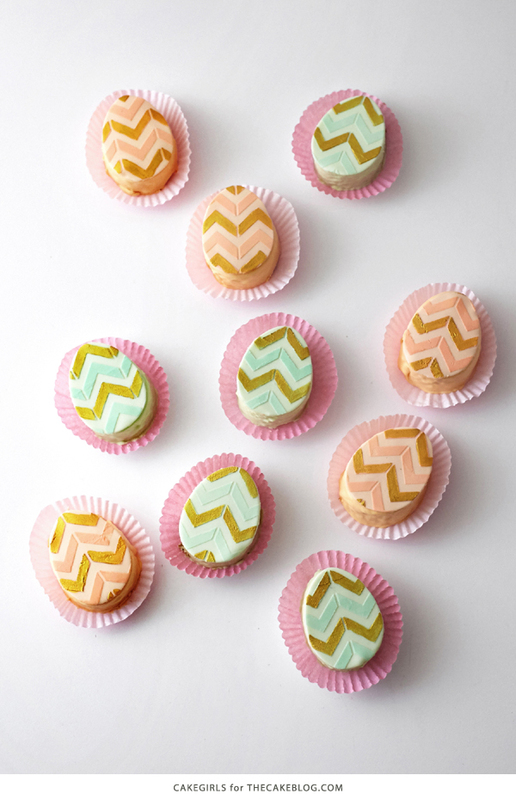 Stunning at their most complex and beautiful, even with the simplest of decoration, these little cakes can spruce up any Easter party. The cakes themselves are actually surprisingly simple; it’s just the frosting that seems to require the most dedication. Either way, The Cake Blog provides the best recipe around; all you have to do is make it your own! A classic Easter snack from the ‘90s, jello eggs are fun and hands on. Your kids will love being able to watch them take shape, and, most of all, they’ll love eating them. Whether you only want one flavor, or dozens, the options are endless! Eat, Think, & Be Merry has a wonderful recipe! In the end, no matter if you want to spend hours in the kitchen or mere minutes, this list has treats for every level of ease. We hope that you have found something to do yourself and to do with love during this Easter season!